The unfolding of autumn puts me in the mood to listen to some of the later chamber works of Brahms. In a recent review I wrote on the Dvorak Piano Quintets, I remarked that when it came to chamber music, of all composers, Dvorak gave me the most pure joy and spiritual satisfaction. However, my experience with Brahms in this genre has been the most satisfying in terms of aesthetic richness, although there have been times when I have felt a little less than fulfilled while listening to some portions of some of his later compositions. I almost sense, at times, a creatively weary Brahms, though I suppose some would say, "no, just a mellower Brahms." However, at this time, I find Brahms' opus 88 String Quintet to be rather more gratifying than his later opus 111, especially in terms of melodic inventiveness. I can't quite relate to the first, second and third movements of the Second Quintet with the same degree of appreciation I have for the fourth movement, and the entire earlier quintet. In any event, the Raphael Ensemble certainly does an excellent job of conveying both a sense of perceptiveness and elan in its presentation of these works. In the First Quintet, it's quality of youthful freshness is particularly apparent. It comes into play especially during the first movement, with its noble sounding opening theme, and its wonderful, swaying second subject that exhibits a charming Viennese character. The development section that follows evinces a feeling of warmth and a lovely intertwining of melodies. In the third and final movement, the group's presentation is absolutely exhilarating. Not to shortchange the second movement, you will find there a very nicely shaped contrast in moods between delightfulness and seriousness. The Second Quintet is executed also in a very fine manner, despite my aforementioned reservations. There is true poignancy of emotional expression throughout the work. The last movement has a marvelous, seemingly valedictory quality. While there is another superb coupling of these quintets, offered by the Julliard Quartet with Walter Trampler on Sony Essential Classics, my preference is for the Raphael's renditions. Some may appreciate the former for its somewhat more gemutlich (mellower) presentation. Additionally, the latter is recorded more vividly on the Hyperion label. I really doubt that one could go wrong with either set. I owned the LP of this when it came out in the mid-80s and loved it. Bought it at David Hedges' Gramophone Shoppe in Tulsa. During a shift to CDs I put it in the purge stack. 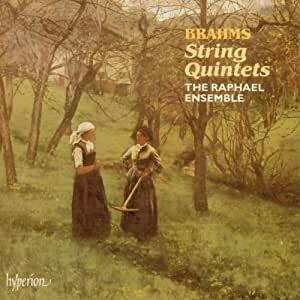 I had bought the Philips 2CD set of all the Brahms quintets with the Members of the Berlin Philharmonic Octet. Very good performances but I knew immediately I was not getting the visceral thrill of the Boston players. The Berliners are more gemutlich. While I do enjoy Brahms played as a romantic, I do not think he saw himself as one. His references are very much classicist. Or even baroque. The finale of the Fourth Symphony is a passacaglia. He took the long view and knew to whom he would be compared. Unlike his contemporary, Tchaikovsky, he wasn't burdened with self-doubt. ps: I am not anti-LP. I just had a downsizing period. I still own, buy and listen to them. And so should anyone. Here are presented two of Johannes Brahms pure String Quintets, not involving an auxiliary instrument (such as the piano) that is, the opus 88 and the opus 111. I was led to purchase this because of a slight defect in my old recording of the 111, and upon hearing of the 88, and how beautiful it was too (and which I did not have), I therefore decided to purchase this, the B.S.O. recording of both works. And though I paid somewhat of a premium, I am very glad I did buy it. But actually what I learned was that, although the 88 is a beautful work, standing right there with all the rest of his chamber music... it is actually the opus 111 that is truly the outstanding work. One senses here, in this piece, a man attempting to sum up his life, and work, of very many august and elegant compositions. And though neither disappoints (and in his chamber work, really, nothing actually ever does), I thought it was the second that was the truly special, compelling composition. A wonderful CD therefore, heartily recommended. And you know, he almost stopped writing shortly after the opus 111 quintet - that is, until he met with a new instrument - the clarinet. 5.0 out of 5 starsBoston's way with Brahms . . . Nothing worse than Brahms chamber music (or any Brahms, for that matter) played ponderously. No worries here. The playing by the Boston Symphony Chamber Players ambles along downright amiably. In addition to the piano and clarinet quintets, these are some of Brahms' sunniest chamber works. A nice starting point if you want to wade into this oeuvre. This is my favorite recording of these works, I was glad to see a remastered version on CD. The slow movement of the F major, marked "grave ed appassionato" is played properly slow here, while many others play it too fast. 5.0 out of 5 starsgreat listening.